The IRHS Hall of Fame recently inducted four new members — Michelle Giorgilli, Colleen Carrol Davis, Morgan Warrington and Nick Slonin.. The Indian River High School Soccer Hall of Fame was established in February of 2017. The idea came about as a way to recognize the many contributors to IRHS soccer, which includes players, coaches and other contributors to the program’s success. Soccer as a whole for IR has been extremely successful. The boys’ program has accumulated more Henlopen Conference South Division championships, overall Henlopen Conference championships and state title appearances than any other athletics program at IRHS, which all have strong histories of their own. The boys have appeared in the state finals five times, while winnings two state championships. The girls have also won themselves multiple Henlopen Conference South Division titles and a Henlopen Conference championship, and have made two appearances in the state finals. Those two appearances came up short against upstate private-school power Caravel Academy. 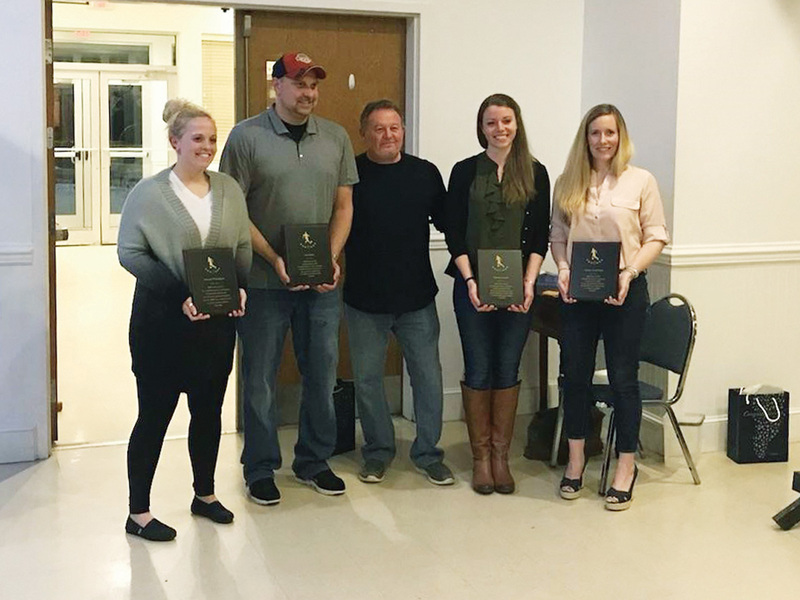 Recently, the Hall of Fame inducted four new members — Michelle Giorgilli, Colleen Carrol Davis, Morgan Warrington and Nick Slonin. All four had made significant contributions to the IRHS soccer program. A graduate of IR in 2008, Michelle Giorgilli had a remarkable athletic career for the Indians. The multi-sport student-athlete was a driving force behind the success of the program over her four-year varsity career, during which she served as a team captain. Her drive, determination, and passion lead the Indians to four straight Henlopen Conference South Division titles from 2005 to 2008. That success also led to appearance in the state playoffs for the Indians. “Being inducted into the Indian River Soccer Hall of Fame is truly an honor, but it’s certainly not an honor that I earned solely on my own,” Giorgilli said from her home in Northern Virginia. “There are so many people that have played a part in the Indian River Soccer family over the years — the players, the coaches, family members, friends. IR soccer wouldn’t be what it is today without each and every one of them. Giorgilli’s playing career was certainly impressive, simply based on the accolades she received during her playing days. Those recognitions included a 2005 All-Conference second-team selection as a freshman, a first-team All-Conference nod from 2006-2008, and a second-team All-State 2006. The team awards included a MVP selection and Team Leadership Award in 2007, Girl of the Game twice, in contests against Archmere and Dover High, and the Coaches Award in 2008. “I remember the days when we would practice in the Gerkins’ back yard,” she recalled. “To now be a part of the Hall of Fame alongside Howard is yet another privilege,” she said of 2017 inductee and coach Howard Gerkin. Giorgilli was one of the first IR girls’ soccer players to earn a college scholarship at the Division I level, going to Delaware State to play under coach Nitan Soni. She was a four-year varsity starter at midfield. When she wasn’t playing, she volunteered with the River Soccer Club as a coach, referee or just about anything else that was needed. Currently, Giorgilli is working in Virginia for Booz Allen Hamilton, where she provides science and technology support to the Defense Forensics & Biometrics Agency. She is currently in the process of planning a wedding. There have been many players that have worn the green-and-gold for the Indians’ soccer program over the years, but none may have had more of an impact on the girls’ team than Colleen Carrol Davis. A 1998 graduate, Davis had played JV soccer for the Indians in the fall of 1994 and 1995, which at the time was essentially a “boys’” team with a few girls as well. Knowing there was a strong interest, she initiated a petition to bring a girls’ team to IR at just 15 years of age. She had plenty of signatures on the petition and then presented it to the school board for consideration. The IRSD School Board created a committee to study the potential for a girls’ soccer program solely based on her presentation. That action then pushed the Cape Henlopen School District to do the same. In the spring of 1996, the possibility of a girls’ soccer program was brought to reality, and Duncan Smith was the head coach. As the team’s sweeper in the spring of 1998, Davis led the Indians to their first-ever DIAA girls’ soccer state tournament. A last-minute win over friendly rival Cape Henlopen was the win that clinched the berth. She also played for the River Soccer travel team, coached by her father, and in the fall of 1997, she made the Delaware Olympic Development team. Davis was able to use her academic and athletic ability to get into a pre-professional medical undergraduate program and play soccer on a scholarship a Philadelphia University. But during that time, she suffered two serious injuries. The first was a knee injury during the last game of her freshman season, and the second was a career-ending neck injury in the middle of her second season. She is currently working for a healthcare group in collaboration with Health Care Delmarva, which is seeking to improve the outcomes of care for all patients in the community. She has continued to volunteer with River Soccer Club and is raising three children, Liam (seventh grade), Desmond (third grade) and Margaux (age 2). Morgan Warrington was a 2011 graduate of Indian River High School, where she was a four-year varsity player for the green-and-gold. She started every game during those four years. Her effort and work rate easily matched her durability and endurance. During her career, Warrington scored 45 goals and had 25 assists. She received many accolades and recognitions for her performances on the field, including being named a three-time first-team all-conference player. She also was selected to the first-team all-state, as well as receiving a third-team all-state. Academically, she was ranked Top 10 in her class and was a four-time academic all-conference selection. “I’m very honored to have been an inductee of the Hall of Fame,” Warrington said. “There’s been so many talented players come through IR in the history of the soccer program. There were a lot of talented players that came through during my high school career alone. To be chosen is very humbling. “There are many other options,” she said of the possible inductees into the Hall of Fame, “and I’m just grateful to have been selected. I’ve played soccer for a long time and for a lot of different teams and organizations. However, IR was one of my favorite teams to be a part of. During her time with the program, Warrington was selected as the team’s Team Most Valuable Player all four years, which was voted on by her coaching staff. Her leadership and ability to motivate others was a characteristic they particularly noted. Those qualities were a tremendously positive influence on her teammates. “There’s so many memories from high school soccer, it’s hard to even pinpoint my fondest,” recalled Warrington, who was also a team captain. “I think, though, I’d have to say that playing soccer and experiencing life with my twin sister, Miranda, is one of the top. We always had a high level of competition between us, and while I can’t say that I liked every single second of playing with her, I loved the opportunity to do so. Nowadays, Warrington and her new husband are in the process of settling in to their new home in Lompoc, Calif. Her husband, Peter, serves in the U.S. Air Force, and they were just relocated to Vandenberg Air Force Base. She is hoping to get back into teaching and playing adult pick-up soccer. There was one final thing though that she wanted to point out. When thinking of IR soccer, a couple names could come to mind: Steve Kilby. Howard Gerkin. Duncan Smith. What about Nick Slonin? The fourth inductee in this year’s Hall of Fame was none other than Slonin, the former IR soccer player and then coach. A 1994 graduate, Slonin had a successful high school career and then transferred that into the coaching ranks. Slonin was a coach for 17 seasons with both the boys’ and girls’ programs. During those 34 combined seasons, he helped to coach multiple Henlopen Conference and South Division championships in both the boys and girls. He helped to coach the girls’ program to two state championship runner-up finishes. He was on the sideline for two boys’ state championships in 2013 and 2015, and was also a part of the state championship runner-up teams in 2012, 2016 and 2017. Not a lot of people get to return home to coach after they graduate, but Slonin is one of those who can say he did. Those wishing to nominate past players, coaches or contributors to the IR Soccer Hall of Fame should contact Chris Conover at (302) 381-9535 or Molly Chamberlin at (302) 228-1219, or send an email to irhssocceralumni@gmail.com.